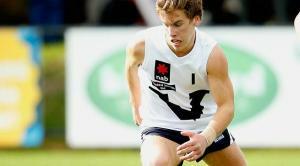 Vic Country has officially claimed bragging rights against its Metro rivals, with a 44-point win today at Simonds Stadium. The victory is Country’s second against Metro in the 2014 NAB AFL U18 Championship, overcoming a slow start to win 12.9 (81) to 4.13 (37). A seven goal to nil second half set up the win for Country. Dandenong Stingray Aaron Wilson proved an ample replacement for Pat McCartin up forward with four goals, 14 disposals and six marks, with Geelong Falcon teammates Joe Maishman (18 kicks, 11 handballs, 7 inside 50s) and Nick Dixon (11 k, 18 hb, 6 clearances) leading the way in the middle for Country. For Metro, Christian Petracca (Eastern Ranges) led the way with 31 disposals (18 kicks, 13 handballs, 6 I50), followed by Sandringham Dragon Ed Vickers-Willis 25 (17k, 8hb) and Northern Knight Sam Switkowski 23 (17k, 6hb & 11 marks). In the first term Vic Metro did all the attacking, gaining the first goal through Damian Cavka just three minutes in, after early misses the Matt Goodyear and Brayden Maynard. The starting lineups proved entertaining in the first term, with Darcy Moore starting in defence, and Christian Petracca in the middle for Metro. Marc Pittonet was dominant in the first quarter with 16 hit outs, having the better of his dual with Gach Nyuon. This helped Switkowski and Petracca get plenty of the football in the first term. Harry Dear provided an option up forward for Metro, and helped his side to a 13-point lead at quarter time with a late goal. Early inaccuracy in the second term hampered Vic Country, as they were unable to finish off the good work by their midfield that were driving the ball forward. Jack Lonie was elusive up forward, and finally gave his side their first major eight minutes in. While Metro replied quickly via Ben Allan, back to back goals nearing time on to Dan Butler put Country in front for the first time in the game. The sides traded goals with Maynard wrestling back the lead for Metro, but Wilson kicked his first to see them back in front. A late goal to Schache had Country enter half time with a seven point lead after a dominant five goal to two term – four of those goals coming in the last 10 minutes of the term. Much to everyone’s surprise, Maynard’s goal at the 20 minute mark would be Metro’s last goal of the game, as they went on to kick another nine behinds in a goalless second half. Country continued their momentum in the third term, with Lonie and Jackson Nelson helping extend their lead to 19 points at the 10-minute mark of the quarter. This was quickly out to 31 points as Wilson added back to back goals, and Metro were held to just the two behinds for the quarter. Alex Harnett helped Country inside forward 50 on four occasions for the term, as Metro struggled to contain their opponents push out of the middle, while Rhys Mathieson had eight clearances to three quarter time. The challenge was ahead for Metro in the final term, but when Harnett kicked the opening goal of the final term, Country had added seven unanswered goals to be out to a 37 point lead. Wilson was proving hard to beat up forward as he slotted through his sides eleventh goal of the day, his fourth, with James Richards kicking a late goal to give Country a 44-point win.